This specially handcrafted Italian Leather Satchel is created for an everyday modern office look, crafted with a unique vintage styling. The Leather has gone through a process of being washed and then tumbled dryed to achieve a slight crinkle and completed with wax finish. The satchel is specially designed to carry every day office files and even a laptop with ease. 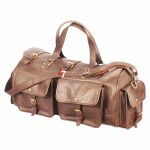 It has a adjustable strap which can be removed, robust carry handle and a spacious pocket in the front. The main body has two strap buckle closer. Antique brown with strawberry tint. Flapped pockets with snap buttons. One flap button pocket on left shoulder. Snap button collar & cuffs.